The capsual includes a small plate with the inscription: “With the blessing of Patriarch Kirill of Moscow and All of the Rus, the consecration of the North Pole marks the 1150 years of Russian Statehood”, a press release from the Church reads. The Church consecration took place as part of the major ongoing Arctic-2012 expedition, a mission organized by the Russian Arctic and Antarctic Research Institute. The capsual was dropped to sea by Bishop Iakov of Naryan-Mar in a ceremony attended by both expedition leader Vladimir Sokolov and ship Captain Oleg Shchapin. As previously reported, the Arctic expedition left Murmansk with the nuclear powered icebreaker “Rossiya” on 8 September. On 13 September, the vessel reached the Pole point, and the expedition subsequently continued through Arctic waters towards the site where the drifting Russian research station “North Pole-39” will be replaced by a new facility. 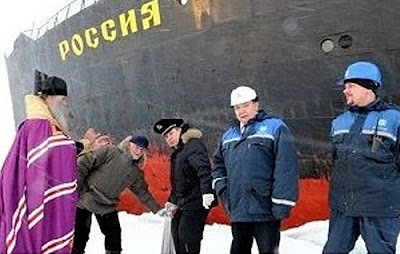 Like the historical planting of a Russian flag on the North Pole seabed in 2007, the recent symbolic, but still highly politically motivated, Church consecration illustrates the current major Russian drive on Arctic issues. Commenting on the Church ceremony, Bishop Iakov says the consecration of the North Pole is of importance not only for the Church, but for “all of Russia”, and that it symbolizes the Russian state efforts on “the return of the country’s former positions in the region”. “The Russian Orthodox Church in all possible ways supports this process”, Bishop Iakov underlined. Bishop Iakov was in early 2012 appointed leader of the Naryan-Mar and Mezen diocese. He has from before attended several Arctic and Antarctic missions and will be part of the whole ongoing one-month Arctic 2012 expedition.